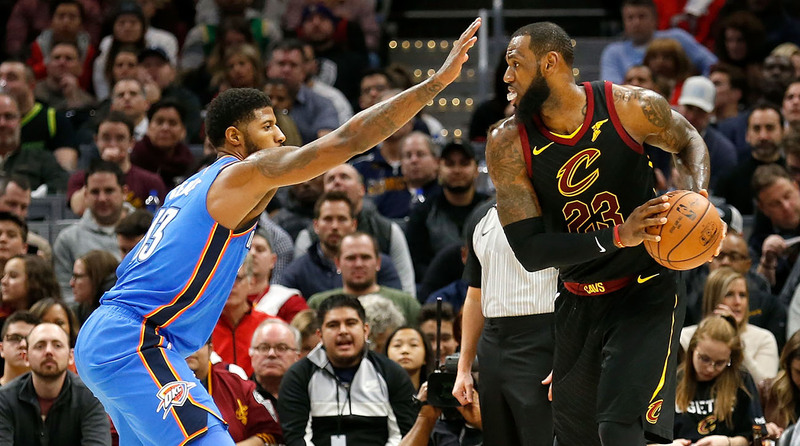 With Paul George opting to return to Oklahoma City and stars like Kevin Durant and Chris Paul also remaining with their current teams, are LeBron's best recruiting days behind him? There was a time, in the not too distant past, when LeBron James’ recruiting exploits matched his transcendent play. The King on the court was the queen on the chessboard, a centerpiece around whom the NBA’s roster-building game revolved. His greatest off-season hits have shaped his Hall of Fame career at every turn, and they have enhanced his reputation as an influential player/executive hybrid. James hatched a team-up plan with fellow USA Basketballers Dwyane Wade and Chris Bosh and plucked Ray Allen from the rival Celtics. He snubbed Andrew Wiggins from The Letter and successfully pitched Kevin Love by phone to join him in Cleveland. He adopted J.R. Smith from the Knicks, saved Wade from the Bulls, and lured a dozen knockdown shooters with the promise of an endless supply of open looks. Along the way, James’s pitch usually produced swift decisions and tidy outcomes because it was self-evident and airtight: Playing with James guaranteed that you would win a lot, compete for titles every year, and become more famous simply by being in his orbit. The 2018 free agency period was only a few minutes old, and yet James’s status as a puppet master has already been dealt a stunning rebuke for the second straight summer. Last year, Kyrie Irving passed on the chance to run with James and the Cavaliers to a fourth straight Finals, instead forcing his way to the Celtics. Then, early Sunday morning, Paul George elected to re-sign with the Thunder on a four-year contract, bypassing the possibility of teaming up with James in Los Angeles, both now and in the foreseeable future. As George and Russell Westbrook puffed cigars at a party in Oklahoma, James’ ideal “Big 3 Part 3"—himself, George and Kawhi Leonard in LA—went up in smoke. James, who flew from Anguilla to LA on Sunday, may now be suffering from both jet lag and déjà vu. As he weighs his own free-agency decision, the four-time MVP must come to terms with the fact that—for the second straight year—his magnetic pull was no longer capable of attracting an All-NBA player who would be especially helpful against the Warriors. Last summer, Irving traded life in limbo with James for a steadier organization to call his own. This summer, George decided to return to a small-market Thunder team that was bounced in the first round without so much as a formal meeting with the Lakers. In the 33-year-old James’s never-ending arms race with the Warriors, both decisions represent massive losses. James dearly missed Irving’s shot-making and firepower in the 2018 Finals, as Cleveland’s point guard corps was an utter mess. Meanwhile, George was an obvious candidate to handle primary defensive responsibilities on Kevin Durant, Golden State’s two-time Finals MVP. Pairing with George on twin max deals in LA would have given James the breather he needed against Golden State while also setting up juicy interchangeable lineups with Leonard. Now, much like in the post-Irving turmoil in Cleveland, it’s difficult to find a home for James that will be ready to challenge Golden State in 2019. James’s new best-case scenario likely involves teaming with Leonard and DeMarcus Cousins in LA. That sounds good on paper, but Cousins has yet to make the playoffs, both of James’s new co-stars would be entering training camp following season-ending injuries, and LA’s young roster would need to be gutted to land Leonard. Returning to Cleveland is even bleaker: Kevin Love and a host of bad contracts probably isn’t enough help to get out of the East, let alone with the Finals. It’s important to note that both Irving and George had good reasons for making their decisions. Irving had already won a title, he was ready to be his own man, and he wanted to get ahead of a possible James departure. Plus, the Cavaliers had shopped him in trades following the 2017 Finals and then abruptly turned over their management team. Oklahoma City played its cards perfectly with George, rolling out the red carper last summer, giving him $137 million over four years, and selling him on a fairly successful partnership with Westbrook. By re-signing, George didn’t have to move again, he didn’t have to acclimate himself to a new roster of teammates, and he didn’t need to brace for years of intense scrutiny in LA. Of course, he also secured his financial future following a major leg injury in 2014. The elephant in the room: Both of those plans explicitly excluded James. What’s more, Durant opted to quickly re-sign with the Warriors, while Chris Paul forced his way to Houston last summer and then quickly agreed to re-sign on Monday. In both of those cases, All-NBA level players opted for younger running mates—Stephen Curry and James Harden, respectively—rather than pursuing partnerships on James’s terms and timeline. In both cases, those decisions will likely pay off with stable championship-contending teams on the court. Who can blame them? To suggest that James is no longer the master of his 94-foot by 50-foot domain would be madness. For evidence of his ageless greatness, look no further than his game-winner to beat the Pacers, or his game-winner to beat the Raptors, or his 46-point Game 6 against the Celtics, or his 51-point explosion in Game 1 against the Warriors. But recent history, and the first hour of 2018 free agency, are starting to tell a different story off the court: James’s best recruiting days may already be behind him.